A total of 65 CTD casts were undertaken on this cruise using a Seabird 911 plus CTD unit (s/n 09P-37898-0782) with 24 way rosette (SBE32 24WAY rosette 32-0344) provided with 20L bottles. A list of calibrated parameters and instrumentation used is shown below. The CTD data were supplied to BODC as processed 2db Pstar files. The Pstar files were converted (using transfer trn360) into BODC internal QXF format (a BODC-defined subset of NetCDF). BODC parameter codes are used to map any variable measured. Null data were set to the appropriate absent data values for the code in the BODC parameter dictionary and flagged 'N', data outside parameter dictionary range flagged 'M' and already flagged data given an 'L' flag. Reformatted CTD data were transferred onto a graphics work station for visualisation using the in-house editor EDSERPLO. EDSERPLO provides a graphical representation of the data so that parameters can be visually checked for inaccuracies. Checks include identifying anomalous data spikes, gaps in the data and values that lie outside of expected limits for the instrument or environment. No data values were edited or deleted so any suspicious data can be viewed and accepted or rejected by the viewer. Flagging was achieved by modification of the associated quality control flag. The aim of the RSS Discovery cruise (D312) was to sample the extended Ellett Line. A total of 65 stations were sampled, 17 on the Ellett Line extension, 21 on the Ellett Line, 15 on Line 'G' and 3 at sediment trap sites. A list of stations sampled for various measurements is included in the cruise report. 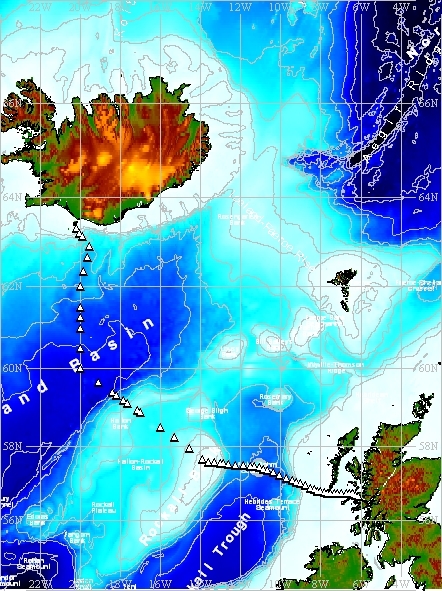 The Extended Ellett line is important oceanographically because it completes the measurements of the warm saline water flowing into the Nordic Seas from the eastern North Atlantic. Raw CTD data (.dat) was converted from enginering units using the calibration information provided in the configuration file (.con). AlignCTD was run to shift the dissolved oxygen sensor output relative to the pressure data by 5 seconds to compensate for lags in the sensor response time. The CellTM program was run to remove the effect of thermal 'inertia' on the conductivity cells, using alpha = 0.03 and beta = 1/7 (the SeaBird recommended values for SBE911+ pumped system). Binary data files were de-spiked using WildEdit and then converted into ASCII format. The Pstar processing transfered the data files from ASCII format to Pstar binary format, smoothed the pressure, temperature and conductivity data by running a 5 point median, averaged the data to 10 second intervals and extracted the down cast date which was averaged to 2db. Independent salinity samples, obtained from the CTD rosette, were used to calibrate the CTD conductivity data. Differences between bottle and CTD conductivity were plotted by station. There was a significant offset between the two CTD sensors. An offset with time was also noted, with residuals varying from about -0.003 to +0.002. The sequence of stations was therefore divided into segments and, excluding outliers, the mean conductivity ratio (bottle/CTD) calculated for each segment. The resulting ratios (see cruise report) were used to correct the CTD data. Following calibration the new bottle-CTD conductivity and salinity residuals were calculated and plotted against station and pressure. Salinities are believed to be good to better than 0.002. The resulting residuals were plotted against station and a series of offsets estimated to make a final correction. Station IB13 is one of the fixed CTD stations, which together form The Extended Ellett Line. The line lies between Iceland and the Sound of Mull (Scotland) crossing the Iceland Basin and Rockall Trough via the outcrop of Rockall. As part of this initiative, CTD dips, together with associated discrete sampling of the water column, have typically been carried out annually at this station since September 1996.